In Chicago, there are Special Service Areas (SSAs) throughout the city, streets that are economic thoroughfares in the neighborhood. SSAs are under local neighborhood organizations and provide services to business owners, like facade and building improvements and marketing and advertising of the area. 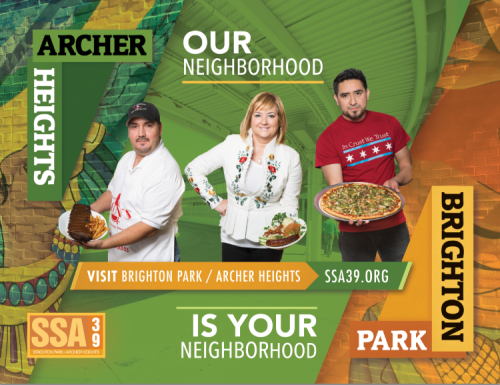 The Back of the Yards Neighborhood Council has several SSAs under its care, one of which is SSA #39 Brighton Park and Archer Heights, which was established in 2007. 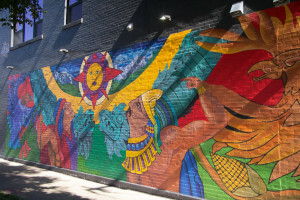 These two lesser known neighborhoods on the Southwest Side of the city are connected through the SSA, which runs southwest down a portion of Archer Ave from California in Brighton Park to Pulaski in Archer Heights. The SSA commission wanted to create a brand identity and an ad campaign to increase the awareness of the area, not only to bring in more visitors from around the city and tourists that happen to pass through the transportation in the area, but also to encourage locals to see their neighborhood as a place to invest in with their time and money. Sparkfactor first worked with SSA #39 on street pole banners and then was selected to work on the branding and ad campaign. To start on the campaign, we had to learn about the neighborhood: what types of businesses were in the area and about the people that shopped and lived in the area surrounding the SSA. To accomplish this, we visited and interviewed many business owners. We learned that the neighborhoods were diverse, filled with business owners who had been in the area for years, owned their buildings, treated their customers like family, and in many cases had handed down the businesses from generation to generation, sometimes having several generations working at the same time. 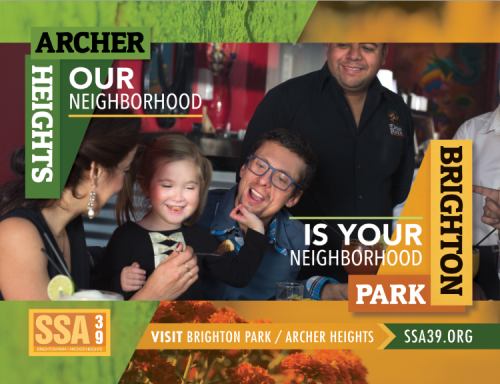 To build up the family values that drive the business owners and patrons in Brighton Park and Archer Heights, we developed the tagline “Our Neighborhood is Your Neighborhood.” It’s a nod to a classic saying in Spanish, “mi casa es su casa.” We wanted to communicate that visitors would be welcome and to increase the community feeling of the area. To start working on the campaign, we needed to have assets. We spent a day doing a photoshoot of the area as well as local businesses and business owners. We photographed prominent intersections and transportation hubs—the neighborhood is close to Midway airport and the Stevenson Expressway, both major thoroughfares in and out of the city, and has the CTA Orange Line running through it. We took pictures of the neighborhood itself, which included some murals showcasing the Hispanic heritage of a good portion of the area, and some of the services provided by the SSA, like the planters that are along the sidewalk. We asked business owners to pose with their products or in action shots as they worked, and took background shots of the stores. After we had the assets, we started working on the ad campaign. 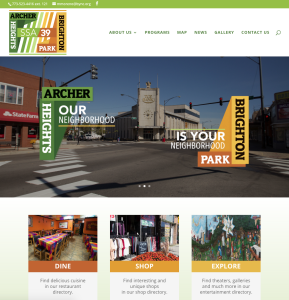 We created a logo that incorporated both the Brighton Park and Archer Heights neighborhoods and used SSA #39 to tie them together. The bright green and orange colors reflect the bright colors of the murals the neighborhood has and the orange connects to the CTA Orange Line that brings visitors to the neighborhood. The names of the neighborhoods act as bookends in the ads, making the middle of the ad—whether it’s the tagline or business owners or a smiling group of restaurant-goers—the most prominent part, supporting the idea of community and of family, which connects both neighborhoods in one SSA. The ads themselves (which you can see below) feature restaurant owners with their signature foods and a group of people at a table in a local restaurant. The focus is on food to focus on family, on gathering together, on a family experience, on a community experience, to show how once you’re in the neighborhood, you’re family. The ads featuring the restaurant owners showcase the diversity of those in the neighborhood and of the offerings in the neighborhood. The ads focusing on the group in the restaurant focus on visitors to the neighborhood, showing how the restaurants in the neighborhood can bring visitors and locals alike together. Because the point of the ads was to create awareness for the neighborhood, the call to action on the ads was to visit the website to learn more about the neighborhood as well as to visit the area to see it in person. We build the ssa39.org website on WordPress, making sure it had the essentials a neighborhood website should have. It contains a member directory, with categories of various places in the neighborhood, which was built using a custom database. There’s a page with maps of the SSA and a page for programs the SSA supports. The website is image-heavy and contains a gallery with additional photos from the photoshoot. Once the design for the ads were complete and the website was up, we created the deliverables for the campaign. We had the ads go up on the CTA Orange line, which runs through Brighton Park and Archer Heights and goes to and from the city to Midway Airport. Ads also appeared on the Orange Line platforms in the Loop—the downtown area of Chicago—where a myriad of CTA customers would see them on a daily basis. We also had postcards printed for the businesses in the area to help them advertise the area themselves. To finish off the campaign, we delivered a brand guideline document to the SSA commission. The brand guidelines will help the SSA commission in the future by setting out standards for how future ads should be formatted and detailing the colors used for the logo and other deliverables. It also includes examples of ads and photography that should be used in future campaigns, if necessary. Do you need to create an ad campaign for a local event, or develop a brand identity for a neighborhood organization? Sparkfactor can help!